My vacation ends today; I'm back to work. Last week I had the opportunity to visit all of my family on different days. I also had the privilege of hearing my brother preach at his church in Mason, Ohio. But today, I'm back in the office. I'm sure that other people also have apprehension when it comes to returning to work after time off. What will be sitting on the desk? What voice mails and emails will have to be returned? What did I forget to take care of before I left? I've only been back an hour, but I must share that God has been very gracious to me. Already I've heard nothing but really good news about the services this past weekend. A co-worker came in and talked to me about the special way God has worked in his life this past week. We prayed together and I also felt God's Spirit blessing both of us. Waiting on my desk was a letter from a parishioner telling me how much my sermon two weekends ago meant to her. That letter was such an encouragement to me. Also, a friend of mine from Colorado sent me a book as a gift, and it was sitting on my desk waiting for me. I know there's much work to do over the next two days. In a few minutes I have to meet with the health care insurance provider and make a decision for the benefit of all our employees. Later today I'm scheduled to meet with our web designer. And while I wrote the basic outline for the Thanksgiving Eve service before vacation, I still have a lot of work to pull it together before tomorrow night. And somehow, in the midst of all this, my senior pastor and I have to get together so we're on the same page. Heavenly Father, thank You for the way you have welcomed me back to work today. May my work bring your pleasure this week. Rick Muchow Coming To Crossroads! The news is now VERY PUBLIC. Rick Muchow, worship leader for Saddleback Community Church in sunny Orange County, California will be coming to Crossroads in cold and snowy Mansfield. This morning's Mansfield News Journal carried a large article with a huge picture of our Magnification Team at Crossroads. I've had the privilege of watching Lori Biddle work behind the scenes to bring this event to fruition. You might want to know how this could have happened. Big lesson learned: the power of the ask! Lori asked and Rick said, "Yes!" Muchow, one of the best known worship leaders in the country, will be at Crossroads Community Church, 1188 Park Avenue West, Nov. 22-23 to lead worship training and services. Muchow's pastor is Rick Warren, who wrote the best seller book "The Purpose Drive Life and The Purpose Driven Church." Warren is the head pastor at Saddleback Church. In addition to singing and playing his guitar, Muchow will give a training workshop for the Crossroads worship team, known as the Magnification team. The Magnification team is made up of 120 volunteers who help with the church band, vocalists, actors and the technical aspect of the service. Lori also was interviewed by the local TV station this past Friday. Check out the pictures over on Lori's blog. Lori... we are all really proud of you! Keep up the GREAT work! Meet Rachael Henry and her husband, John. Rachael is our ministry leader for CLASS. She is the one who takes registrations, reminds people when and where their CLASS meets, and greets students when they come in the door. She also works with all the CLASS teachers, coordinating rooms and audio visual needs. She does a great job and I'm so glad to have her as part of our team. I love rainy CLASS Saturday mornings. If the weather is too nice, people might be tempted not to come to CLASS. If the weather brings a major snow storm, people might be smart not to come to CLASS. But rainy? Might as well go to CLASS! You might be wondering: 'What is CLASS?" CLASS stands for Christian Life and Service Seminars. We offer five CLASSes and encourage our members to take all of them. Each CLASS is four hours in length and focuses on one area of the Christian life: Membership, Maturity, Ministry, Missions, or Magnification. I believe CLASS is one of the reasons why Crossroads experiences such unity in its congregation. By attending CLASS, each member knows what our church believes, why our church exists, and how they - as members - can be a vital part of this ministry. Rain rain go away, come again some CLASSy day! Today is that day! Crossroads was really hopping tonight! There was so much going on. My area of responsibility was for the Church Community Builder training for our small group leaders and several of our ministry leaders. We offered two training sessions this evening. Our first session lasted for one hour, from 7 PM until 8 PM, and focused on an overview of the entire database program. Our second session, from 8:15 PM until 9:15 PM, zeroed in on the specific ways to use the group functions of the software. About 50 people came to the training. Rachael from CCB conducted both sessions remotely via Skype. We could see what she was doing on her computer on our two large screens and hear her voice over our speaker system. Rachael did a GREAT job - extremely clear in her presentation as well as engaging our audience. They clapped enthusiastically for her at the end of the training. This is a big step for us and our database program. 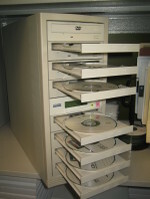 We began the process of moving our database to CCB back in August. Up until now our users have been limited to our staff members. After tonight, we'll add another 50 users. We have another session, identical to this evening, scheduled for December 5th. And we have additional training sessions planned for our staff. By the end of the year my expectation is that we'll have well over a hundred people actively using the system before our congregation launch date of January 1. By then our leaders will have been on the system and talking it up with those with whom they share ministry. And by the beginning of next year we hope to have pictures up for at least 500 of our members. One other note for anyone considering CCB and the initial training phases: I would highly recommend the virtual, remote training options. They are much more cost effective and, in my opinion, learning effective as well. With professional trainers like Rachael, it's hard to go wrong! This morning I was reading It: How Churches and Leaders Can Get it and Keep it by Craig Groeschel. The chapter I'm reading now is on the topic of failing forward. Craig writes that great churches are "led by aggressive, do-what-it-takes, thick-skinned people who are willing to make mistakes." My heart broke. These were my heroes, the ones who mortgaged their homes for the vision of the church. They had endured harsh criticism for their ministry experiments. Sometimes they broke through ceilings. They busted barriers. They shattered paradigms. They led the way for thousands to follow. They had it like few other churches I'd known. And now they were starting to lose it. This leader's quote stuck in my mind: "Failure is not an option." I agree wholeheartedly. In our meetings I repeat it to our staff over and over again, with a little twist: "Failure is not an option. It is essential." I so identified with this as I read it this morning. On my desk I have a picture of myself running in a marathon in which I became injured. As a result I was unable to run the entire race. But I kept the picture and inscribed in the acrylic frame the words, "Victory through Failure." There are days when everything just seems to fall into place. When everything works. People get along. Projects are completed. I can see the mission being accomplished. Today was one of those days. We had a great staff meeting this afternoon. There was a camaraderie to the place. The staff seemed to sense the same thing I did. While we ate lunch together, people took turns talking about what is going on. (Check out the agenda here.) And there is SO MUCH going on right now. Jeanette told us that there are 8 new families checking out the Family Ministry Department since last week's Harvest Party. Lori was excited as she told us her big plans for Rick Muchow coming to our church on November 22nd and 23rd. Deering told us his plans for the small groups' leaders meeting. Ron told us about the incredible goal of providing 600 children in Richland County with their Christmas presents this year! Jonathan told us all about the plans for the website and for the new photo directory. Deb told us that she took 140 pictures for the new directory last weekend. Tim gave out prizes for best costumes at the Harvest Party. It was just so incredibly great to be a part of this staff, to be on this team. We are HAVING FUN while SERVING GOD! Does it get any better than that? Most of the USA this morning is focused on the huge win by Obama. Not me. Don't get me wrong. I'm glad our next president was elected. It's really the very best way to get a new president! What I mean by not being focused on it is this: Today is First Wednesday! That means an all staff meeting at noon today and it means communion service at Crossroads tonight. And that means for me as executive pastor that I have to be on top of my game today. I cannot "slide" into this day casually or the picture above could become a reality! This means I have to give a great deal of thought to what is going on in the church and with our staff. As the staff leader, I set the agenda. Hear me well - this does NOT mean I do it all. Can you say, "impossible?" Can you say, "foolish?" What I do mean is that I have to know what's going on and make sure that "what's going on" is known by the whole team. Each staff "player" is focused on his or her own gig, and that's good. They're specialists and hard workers. Staff meeting gives them a chance to see everything else that is going on. It gives them the chance to experience the "team" of the staff. Lazy Church Staff? Are You Kidding? wow. that was pretty harsh. i didn’t mean for it to come out so bluntly. My reaction? SHOCK! On so many levels. First, I've been on the church staff here at Crossroads since 2004 and I have NEVER WORKED SO HARD IN MY LIFE! To put that statement into perspective, I spent my entire pre-ministry life (28 years) as someone self-employed. When you're self-employed, if you don't work you don't eat. With that in mind I say again - working at Crossroads is tough work. I'm not complaining or anything... love the work... love the challenge... but long hours, short nights, sacrificed weekends, stressful conversations, great expectations, high energy, and sometimes conflicting agendas all create a job you have to love or you won't survive. Crossroads' Readers: Welcome to Church Requel! I'm glad you're here! If you've linked from the Crossroads' main website and are wondering what the staff blogs are all about, let me bring you up to speed. A few months ago, a few of us began writing about our daily experiences in ministry. Here at Church Requel I write about Crossroads in particular and the church world in general. I love to discuss the topics of leadership and church management. And every now and then I have some fun here too. So check out my blog. Click on the topics. Write comments. And please, come back often. There's something new here every day! Our lobby area, what we call Town Square, was really alive today. And that's the way I like it! On the east side at the SERVE kiosk, we had a large flat panel TV looping video promos for the Parking Team and the Cleaning Team. The GROW kiosk was signing up people for November CLASSes and the Small Group hub was buzzing with videos promoting small groups and the new Pulpit Study Guide. In addition to all this, in the center of Town Square, we placed a large display we named "The Photo Op!" This is where our members and attendees can get their pictures taken for our new online directory. This "Photo Op" display will be up all month long. At 10:30 this morning, I received a panicked email from Lori Biddle, our magnification director, reminding me of all the things that will be happening in November. "Mark, did you remember that we begin promoting Adopt A Child and Rick Muchow on November 22 and 23?" I assured her I had remembered both (while I was in the process of remembering them) and that we could easily accomodate everything happening. The point is, things are hoppin' in Town Square these days. They'll be hoppin' even more in the days to come! Today Tim Armstrong told our congregation how to deal with these false recordings that play continuously in our minds. We must learn to see ourselves as God sees us. God sees us as acceptable, valuable, and lovable. If you would like to watch (or rewatch) Tim's talk from this weekend, go to the Crossroads website, let your mouse hover over "Services," then click on "Weekend." 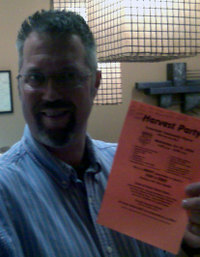 Why do we host the Harvest Party? 1. We leverage our society’s celebration of the holiday. Halloween is one of the most celebrated days of the year. We want to take advantage of that fact for the benefit of the kingdom of God. We are criticized by some for celebrating the pagan holiday. The fact is this: we offer a Halloween alternative. None of our staff or volunteers dresses in scary costumes. None of our games or settings are oriented toward Halloween. Over the years parents have learned that Crossroads is a safe place to take their kids, for free, to have non-haunting fun. 2. We invite the unchurched to give church another try. Last night was pure outreach. Other than those who volunteered, I saw very few of our own people last night. The thousands who came were mostly people who have never been to a Crossroads service. As they walked through the Town Square or auditorium or kids area, they saw our church. I t’s our hope that some of them might have considered what it would be like for this to be their church. Each child who came received a goodie bag to help them collect candy. Inside each goodie bag was a brochure about our kids’ programs and an invite card announcing our next sermon series. History tells us this works. Last year our weekend attendance increased by 15% in a single week after the Harvest Party! 4. We remind ourselves of our calling. Anyone who thinks the mission field is on foreign shores just hasn’t gotten outside the four walls of their church. We are in the market place of Mansfield. The mission field, for us, is all around us and inside us! Each week people come to check out the claims of Crossroads. Yes, I’d love to say the claims of Christ. But that’s not where people start. They’ve heard about Crossroads and they are curious. They come to check out the place. When they do come, we then tell them the good news of Jesus Christ, who desires to be not only their Savior, but also desires to be their Lord. When I looked into the eyes of the hurting and the lost last night, I was reminded of why we do what we do. We want to be the tool that Jesus uses to tell his story and his love to a world, who desperately needs to hear Christ’s story and to know Christ’s love. Harvest Party, Here We Come! Here is Dan Fleming on the left, our worship leader. And on the right is Deering Dyer, our small groups pastor. This is me on the left, playing King Henry VIII. Lori Biddle, our Director of Magnification, is playing a flapper. And Jonathan Pierce, our technology specialist is Dr. Ivan A. Brane. Ron Biddle, on the left, is our Director of Membership playing the nerd in love. Hippie girl in the middle is Kris Tomlinson, the administrative assistant for the Membership Department. Hippie boy on the right is Milo Sgambellone; he's another one of our worship leaders. Top left is our priest, Steve Browing, in charge of all weekend mag tech issues. Center is Alissa Brokaw, our receptionist. What's really cool about her costume is the M&M idea - her two sons are Marlin and Matthew. And on the right above is Tabitha Caskie, in charge of Elementary ministries. Pam Ervin, above left, is our administrative assistant for the Family Ministry Department. Tonight she played the part of Dr. Pepper. Julie Fike, above center, is the personal assistant to our senior pastor. The far right picture above is Jeanette Chase, Director of Family Ministry Department and the one who is in charge of the whole Harvest Party. Standing with her is Allison Litt, our Junior High pastor. On the left above is our Senior High Pastor, Jesse Rider. Above center is my hippie assistant, Deb Hammer. Greg Crawfis is on the above right dressed as Builder Bob, appropriate since he is charge of facilities maintenance. Beth Barnhill, above left, is in charge of our pre-school ministries. Charlene McPeek is the leader of our four nurseries. And Greg Rudrick, above right, is the leader of our volunteer teams. Tim Armstrong, our senior pastor, played the medieval king of France as he passed out candy to all the kids who came through the doors. Tim and I have put together a $40 prize for the staff member with the best costume. Who do you think should win it? Click on the comment link below and let me know what you think. It could influence the judges! UPDATE: It's almost 9PM and I am exhausted. I really have no idea how many people came through our doors tonight, but it was way in the thousands. Now we begin preparing for what we hope is a big follow through in this weekend's services. Our new web design team, Synergema, has asked us for some pictures of what a typical weekend looks like at Crossroads. (Go here and here if you want to know about our decision to partner with Synergema.) So I got my trusty digital camera out and started taking pics. I have set up a new photo album, named A Sunday at Crossroads. Lori Biddle took pictures from the inside of the auditorium, but I don't have those yet. I'll add them as soon as I receive them. UPDATE: Lori's pictures are now posted. The first few pictures in the album are from the outside. I wanted to give Synergema the feeling for our church being located in the market place. Our church is on "Miracle Mile," a string of shopping centers along Park Avenue West. The next set of pictures shows the Town Square area, where the kiosks and cafe are located. This is where people congregate before and after the services. Then I took some pictures of the children's areas to show the bright, bold colors... however I didn't take pictures of children. When we get them, I'll add the pictures of auditorium so one can see what the services at Crossroads look like. This particular Sunday happened to be one in which 14 people were baptized during the service. Cool! Fridays are Management Team day for me. I join Senior Pastor Tim Armstrong, Director of Family Ministries Jeanette Chase, and Director of Membership Ron Biddle every week on Friday morning. Usually we meet for two hours from 10AM until noon. We usually try to keep the first hour focused on current ministry status, while we try to take the second hour to focus on one particular concept, vision or discussion. Often we get away to Panera Bread together. But for three weeks, we have given ourselves over entirely to the work of planning 2009. Last week we spent the entire morning making plans for the calendar. You can see the aftermath of last week's meeting in this picture. This morning we will spend another four hours on the back half of our mission statement - the maturity of our members. Are our members growing in Christ? Are they becoming more mature? What's working? What's not working? Our strategy for maturity currently is three-fold: Midweek, small groups, and CLASS. Is this the same strategy we should use for next year or should we address the tough questions of what IS working and what ISN'T working? Should we stop what doesn't work and instead focus on what does? Is there something else that we SHOULD be doing? This will be the subject of our meeting this morning. Next Friday we meet for one more marathon session. Given the calendar we planned last week, and given the maturity plans we set today, next week we will address the budget questions. How do we fund our plans? This is an exciting time to be a member of Crossroads. If you are a member, you should know that your leaders take our charge very seriously. This morning I got up extra early just so I could spend some time with our Lord: reading His word, journaling, praying... making sure my heart is in the right place so I can be sensitive the Holy Spirit's leading in our meeting this morning. Crossroads Gearing Up for Best 4th Quarter Ever! Crossroads' staff members are operating at full capacity these days. Yesterday morning, I pulled into the parking lot at 7AM and pulled out last night about 9PM. And when I arrived I wasn't the first one there. Tim is a habitual early riser and an early worker. His truck was already there when I pulled in. And truth be told, I did escape to the gym yesterday afternoon for a couple of hours. It's not good for anyone to have a chief of staff stressed or unhealthy! Why all the work? Crossroads is normally a high octane place, but these days are even busier than normal. 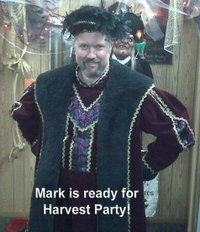 For one thing, Harvest Party is now less than a week away. Last Friday Tim, Jesse, and I all went to the costume rental place to pick out our costumes. As you can see I plan to attend as King Henry VIII. I'd love to tell you what Tim and Jesse are planning, but I don't want to spoil their surprise. Each year the staff really takes this event seriously. We all dress up for it and we all try to be highly visible the entire evening. We expect somewhere between 5,000 and 7,000 people to come through our doors next Wednesday evening. This is a great Halloween alternative for our community AND has proved in the past to be a great outreach event for Crossroads. We typically see weekend attendance pick up by 10% to 20% after the Harvest Party. So, of course, the Magnification Department is gearing up for a large audience in November. We are putting together a series geared more to the person investigating the claims of Christ. We will announce the new series this weekend (so I'm keeping mum for now). Each person in the audience this weekend will receive an invitation card to give to a friend. 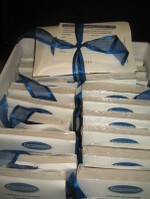 And, during Harvest Party next week, every goodie bag (7,000 goodie bags?) will leave with an invitation. In addition to all the ministry issues happening, my office calendar is filled with normal end of year 4th quarter activities. But in my case nothing is normal since this "Executive Pastor" position is new to me as of July 1. So I'm taking every aspect seriously and doing my best with it. (Hence the 5AM wake ups.) One area I have focused upon is the performance review of every staff member. I have set a target of October 31 to have this completed. This is a much bigger chore than I imagined it to be, but I'm already seeing great fruit as a result of the many conversations I've had this month. 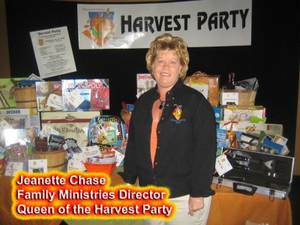 This morning I complete my last evaluation; Jeanette Chase, our family ministries director and queen of the Harvest Party is on my radar screen. I'm thinking she will be pleased with what we talk about today. The reviews are important because we are also getting into our planning for next year. This means budget proposals and calendaring. The biggest item by far in our budget is the staff compensation. So I'm gathering much information for our management team and for our elders to consider. The evaluations are only one piece of the puzzle. I've also joined the National Association of Church Business Administration (NACBA) so that I might gather data on what our staff members might be earning for their jobs in churches similar to ours. To make certain that I don't bias the numbers (since I'm a staff member too), we have a compensation committee of four non-staff people who select the criteria and match the job descriptions to the national averages. This year we have based our comparatives on 3 factors: (1) churches with a similar weekend attendance, (2) churches with a similar annual budget, and (3) churches also in the Midwest. Beyond the budget and performance reviews I have about 35 other projects that I am currently overseeing. You read that right: 35! It can be mind boggling if I let it. To make sure I stay on top of everything I spent an hour Tuesday morning just writing everything down. Then I thought through who the best staff person was to lead the charge on each particular project. Using the Outlook task function, I then went through each task one at a time and entered it for myself and for the fellow staffer who would work it. This way as they update their progress I'll be able to see it on my own computer as well. Blogging about my days are fun, but my blogging time allocation has been reached for the day. It's time to stop writing about the day and start living it. If you are a Crossroads parishioner I want you to know how much I value your continued support and prayers for me and the rest of your staff. We all know we do not work within our own power. We trust fully in the mighty power of God through His Holy Spirit provided so richly to His children (Romans 8:9,16). So pray that we continue to rely fully upon God and trust Him for the results! Is Your Church a Babe's or a Denny's? This past Friday morning our management team began the process of evaluating ministries and making plans for next year. In preparation for that meeting I wrote here that we do a few things really well, but not everything. We should not try to be all things to all people, but focus on those things that God has called us to do. By the time we set down to eat, the place was packed. After enjoying an amazing meal I set there dumbfounded. Every day at lunch and dinner this place is packed out because they serve two things . . . very well. The author, also a pastor, goes on to explain that his church does a few things well, but doesn't attempt to be Denny's of the church world. What does he mean by Denny's? Too often as churches we try to be the “restaurant” that serves everything excellent and we end up becoming a Denny’s that serves a lot of things just mediocre. We attempt to offer a 20 page menu of everything anyone would ever want to “order” at church and try to serve them all. We end up with frustrated “customers,” burned out employees, and a reputation of just being a mediocre church. Just as in the restaurant business this small menu approach does have its downside. First off you won’t appeal to everyone. But that’s okay. As pastors with a heart and love for people we want to reach everyone. But in our attempts to reach everyone we end up reaching less. The more defined we become it actually opens the door to touch more people. The four hours the management team invested Friday morning in planning and dreaming for next year was just the beginning of a long process. We started by writing down all the possible things we could be doing. Then, one by one, we began erasing things that were good ideas but not great ones. Or possibly even great ideas for another church. We then began asking the hard questions about things we're already doing, but not doing with excellence. Is it possible that we could actually reach more people (do more) by attempting to do less? We have much more work to do, but I believe that Crossroads could look like a very different place one year from now, if God continues to bless our work, and if we continue to be focused on doing a few things really, really well. Announcements. The bane of the worship service. The worship service is going great, the momentum is building, there's excitement in the air. Then the announcement guy walks out onto the platform. Too often the momentum is killed and the teaching pastor has to work hard at bringing back the excitement. For the most part this has not been true at Crossroads. Lori Biddle has worked hard over the last 12 years to make the announcement part of our worship service a highlight instead of a lowlight. Last month she wrote about what she's learned over the years about announcements. I just walked off the platform this Saturday night after giving the announcements and have to make the announcements twice more tomorrow. While Lori can do a lot in programming to make announcements great, there is a lot the announcement guy can do to make this time go great and fit right in to the worship service. Here are 4 things to remember when making announcements. Be excited. Be enthusiastic. Attitude matters! Be happy about making the announcements, even if they aren't such great announcements. One thing is true for certain. If you are excited about what you're talking about, there's a good chance the audience will be excited as well. But if you are not excited, enthusiastic, and positive, then there is no way the audience will be. Be short. Get to the point. This is not a time for long stories. But it is a time to weave in conversation into the announcement. I never read from a sheet of paper. I look at people and talk right to them. If there's great news, tell it with joy. If there's tough news, be straight. Each minute of announcement time SEEMS like an eternity to a service programmer like Lori. Be connected. Be a part of the service. There's something that has already happened before the announcement and something that is going to happen after it. Don't ignore that. Tonight there was a great opening musical piece. The audience was clapping and so was I. It was a cool moment and I didn't rush out of it. I thanked the guitarists for their music. Then I got into the announcements. When they were over I turned to our worship leader, Milo, and asked him to take over and lead us into worship. Lori Biddle is rather infamous around this place for saying, "Transitions, transitions, transitions!" She's right. Transition well from one segment to another. Announcements don't have to be the bane of the service. They shouldn't be a pain, tame, or lame. You can actually reign in this game if you're willing to do the same! I'm getting ready for an all morning management team meeting this morning. The focus of this morning's longer than usual session is to work on the calendar for next year. The idea of this calendaring meeting came out of a budgeting discussion we had several weeks ago that went something like this: "So exactly how do we go about the budget for next year? What is the vision? What are we wanting to accomplish? Do we want to budget by simply taking this year's numbers and working from there? Or do we want to budget to our vision and to our goals?" We all agreed that we wanted to set the budget according to what we envision God wants us to do next year. Thus the upcoming meeting. In the back of my mind, though, is a recent reading from Craig Groeschel's new book, it: How Churches and Leaders Can Get it and Keep it. Craig writes a chapter called, "Divine Focus," in which he makes a point that we at Crossroads have believed for years. "Too many ministries are doing too little by doing too much." He references another favorite book of mine, Jim Collins Good to Great, which points out that the enemy of the great is the good. We can do many good things. But what are we really great at doing? Crossroads cannot be everyone's concept of the ultimate church. God has not called us to be the only church or even the best church in Mansfield. We do a few things really well. We are known for our weekend services. Each weekend more than 2,000 people come through our doors. Our database tells us that at one point or another more than 5,000 people have been here. That's pretty significant for a city of only 50,000 people. We're getting great at small groups. Since we brought Deering Dyer on board as our full time small groups pastor, we've seen our small group ministry grow steadily. Now there are 700 people in our congregation involved in small groups ministry. Our family ministries department is top notch. There are more children here on any given weekend than in any single elementary school in the county! Jeanette Chase is an awesome administrator and organizer. She and her team are also responsible for the annual Harvest Party, in which more than 5,000 people show up on the last Wednesday night in October. So, now I'm getting ready to go into a meeting to calendar for next year. I've been asked to write down some good ideas for next year and I have done so. I've put six ideas to paper. I'm guessing the other 3 members of the management team have done the same thing. That would be 24 possible good ideas. But the REAL QUESTION in my mind is this: Do these ideas represent us continuing our excellence in the GREAT things God now has us doing? Does God want us to endeavor to become GREAT at one more thing? Or will these good ideas become the enemy of the great things God has us doing? You may be wondering what I'm talking about. Two years ago we came up with the idea of offering 'New Believer Gifts' to people who make first time commitments to Christ in one of our services. We include a New Believers NLT Bible, a congratulations letter from Tim, instructions from me on how to get connected into the life of the church, a CD with two sermons on it, one from Tim on how to grow in Christ and one from me on how to understand their Bible, a booklet about the purpose driven life, and a booklet about their new life in Christ. Back to Friday morning. I thought we might not have enough of these gifts ready to go. Why? Because work as Executive Pastor is often about the urgent and I just hadn't checked lately! No excuses for moi. Should have known. Like the football player that can't stop to worry about the last blown play, but has to get ready for the next play, I decided on my next play: throw myself on the mercy of Julie's court. Julie is the assistant to our senior pastor. More to the point, she is the one who put these gifts together the last time and knew how to do it. We decided that we would both come in at 4PM on Saturday and make an assembly line. I then called my administrative assistant, Deb, and asked if she would be willing to join the fun on Saturday. She never hesitated and committed to helping us out. On Saturday we unboxed our supplies and found out we were short on CD sermons. Figuring I couldn't mess it up too much, Julie told me to go to the Resource Center and make copies of the sermon CDs. Seeing the glazed look in my eyes she said, "Mark just put the master in the top, blanks in the other seven trays and press the green button. You can do this. Now go!" She might not have said it exactly like that, but with new found confidence I learned how to make CD copies! Actually it's kind of cool. Meanwhile, as fast as I could get the CDs back to the conference room, Deb and Julie were putting the packages together. Julie was using a nifty little shrink wrap device that literally melts the plastic around contents. 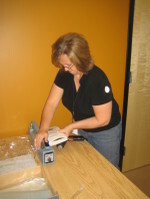 Deb was then wrapping them in ribbons and inserting the all important numbered information card into the top. When people come after the service and ask for the gift, we ask them if they would fill out the information card. We want to pray for them and keep up with their progress. I've never had anyone have a problem with this. Occassionally, we will have someone ask for the New Believer's Gift for "someone they know who has just become a believer." We politely tell them that we have a limited number of gifts and that they are only for those who have just become a Christ follower in the service. Most people understand. But some leave displeased. One other question comes up sometimes. Why don't we do this every weekend? Simple. It would lose its specialness if we did. I know that different churches may disagree with us on this point, but it seems to us that if we extended an invitation every time the church doors were open, then the unique, incredible, amazing, beyond belief that requires belief offer of Christ would just become another standard fare part of the church service. So we're strategic about it, usually making the invitation and the gifts available once per sermon series. I'm hoping that we give them all away this weekend and have to go make more right away!